There are hundreds of easy vegan Thanksgiving recipes out there that will satisfy all of your friends and family. Here are just a few - as always, you can change these to match up with your tastes or whatever you have on hand. These recipes make about 4-5 servings and can be easily doubled or tripled. 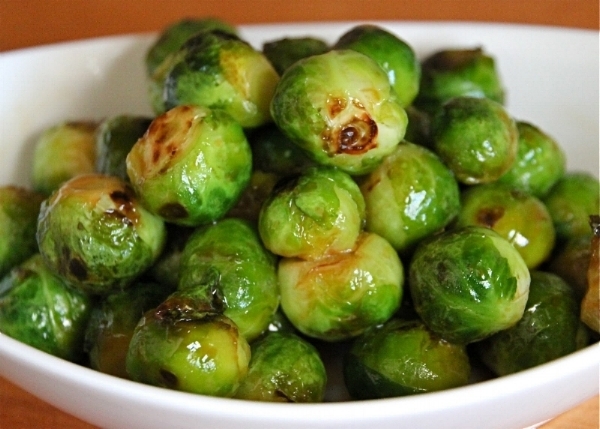 - Heat oven to 350 degrees F.
- Arrange Brussel sprouts on a baking sheet. - Mix together oil, vinegar, salt and pepper and drizzle over sprouts. - Bake in the oven for 25-30 minutes. - Mix all spices and add to frozen corn. - Heat up in microwave or on stove top. - Sprinkle with cheese or yeast and serve. - Boil carrots in water for about 15 minutes. - Drain and stir in maple syrup, butter, rosemar.y, salt and pepper. - Preheat oven to 425. Toss all ingredients except cilantro together and layer on to two baking sheets. Cook for 15 minutes and turn over (or just stir them around). Cook another 15 minutes. Sprinkle with cilantro and serve. - Mix in medium bowl soy, garlic, brown sugar and pepper flakes. - Toss green beans on mixture. - Heat up sesame oil over medium heat. Add green beans and cook for 3-5 minutes –keep stirring. - Use broccoli instead of green beans. Add sliced mushrooms or red pepper. - Change up the spices - use olive oil, thyme, salt and pepper-delete soy, sugar and sesame oil. - Heat oil over medium high heat in a large pan. Add onion and cook for 4-5 minutes. Add garlic and cook for 1 minute. Add kale, stir and cook for 2-3 minutes. - Add coconut milk, salt and pepper and cook for 5 minutes. Top with coconut flakes if using. - Replace kale with Swiss Chard or spinach. - Put potatoes in a large pot and cover with cold water. Boil for about 30 minutes. 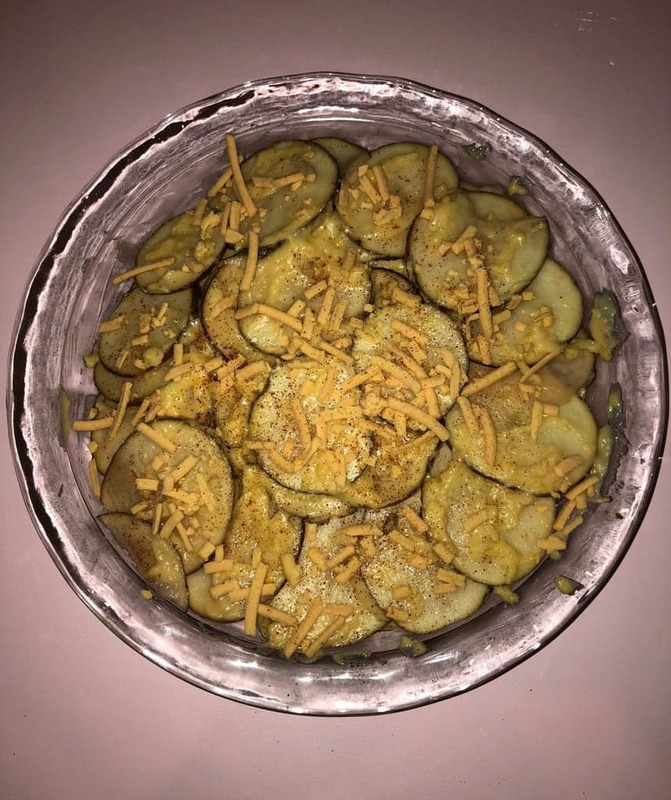 - Drain potatoes and add to a large bowl. Add butter, salt and pepper. - Mash with a potato masher or use a hand mixer (don't over mix). - Mash the roasted garlic and stir into potatoes. - Taste and add more salt and pepper if needed. Sprinkle with chives and serve. - To roast garlic, wrap cloves in tin foil add a few drops of olive oil and roast in oven at 400 for 30 minutes. - Replace potatoes with sweet potatoes. Replace garlic with a small sprinkle of cinnamon and nutmeg. - Heat up oil or butter in a large pan on medium heat, add celery, carrots, onions, mushrooms and spices. - Cook for about 5-6 minutes. - Place rice, bread and veggie mixture into a large bowl and add as much stock as you need to make the mixture moist. Taste and add more salt and pepper if needed. - Put the mixture into a baking dish that has been greased with oil or butter. Cover with foil and cook at 375 for about 30 minutes. - The sky is the limit with stuffing, add nuts, dried fruit or other vegetables.